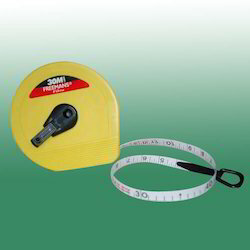 Bright Medi-Weld Appliances excels in rendering a qualitative range of Measuring Tape & Freemans Products, which is offered to the clients at leading market prices. The Tools are highly appreciated by Construction Engineers, Professionals, Students, Researchers, Govt.Agencies etc. We have a range of latest Engineering Tools which are Simple to use, Less Time Consuming, Accurate & suits your application. Heavy Duty rectangular profile with two vials to ensure accurate measurement. Stretches out to the required length like a telescope and is folded back for easy carrying. 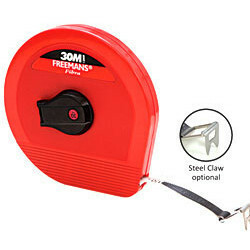 Maintenance free sleeve firmly holds the telescopic measure at any extended length for accurate measurement. 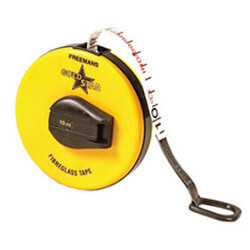 Useful for single handed measurement in rough building sites, wood/timber, concrete building structures and shuttering work. Available size : 3m,4m,and 5m. 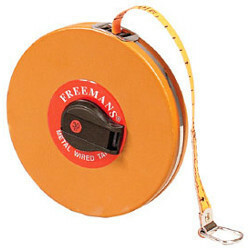 Bright Medi-Weld Appliances introduces freemans™ High Quality Fiber Tape.30mtrs long. Roll-in Type. Accuracy: CLASS 3 guaranteed By EEC pattern approval. Performance Ability: Over 3 Times Longer life than Metal-Wired Tapes. 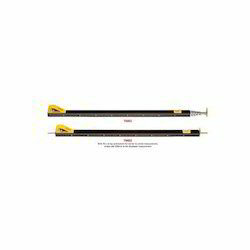 Non Conductive: Ideally suited for use where electric hazards exist. Easy to Clean: A Damp Cloth is all that is necessary to remove dirt, mud & other Stains. Weather Resistant: The Figures, Lines& the Plastic coating remain unaffected by water. Non-Creasing: The Plastic coating makes the tape Resistant to Crumpling. 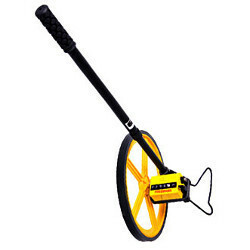 ABS plastic wheel is extremely light weight and durable. Tough yet light ABS case with ribs for easy handling & strong grip. Compact and light ABS case. 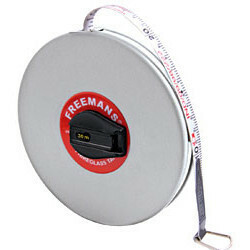 1 mm marking with class II accuracy ribbon optional. Tough yet light weight ABS case reinforced with metal for extra strength. 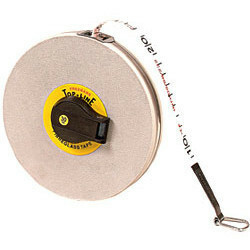 A general purpose tape woven to width with copper wires lengthwise for additional strength. Coated with special paints for protection against moisture, wear and tear. Impact resistant vinyl leatherette covered case for use in taxing conditions. The compact size of this model offers features like normal measurements, continue, indirect, historical memory, volume and surface area measurements. 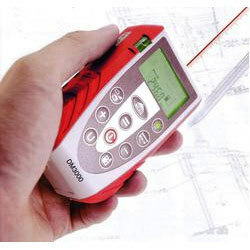 The red laser point is clearly visible on the measuring spot even on difficult places. The special Ergo-Express button on the site of the instrument makes handling by one hand more easy. An integrated water level makes proper horizontal leveling possible. Measuring range from 0.5 to 50 meters with an accuracy of 2 mm. 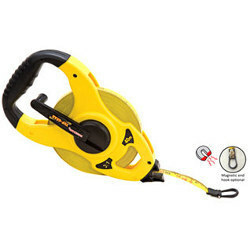 Powered by a 9 volt battery and suitable for 5000 readings. For more details please feel free to mail us.